Taxonomy: Electric Scallop belongs to the Kingdom Animalia, Phylum Mollusca, Class Bivalvia, Order Pterioidea, Family Limidae and Genus Lima. Scientific names: The scientific name of Electric Scallop is Lima species. Other common names: Electric Scallop is also commonly known as Electric Eye (Flashing) Scallop, Electric Flame Scallop, Red Electric Flame Scallop, Flame Scallop and File Shell Clam. Origin or natural range: The Lima species originates from the Indo-Pacific region including the Great Barrier Reef and the Carribbean Sea. Size: Electric Scallop may grow up to a diameter of around three inches to five inches. Color: The Lima species occurs in Red, Pink and Tan colors. 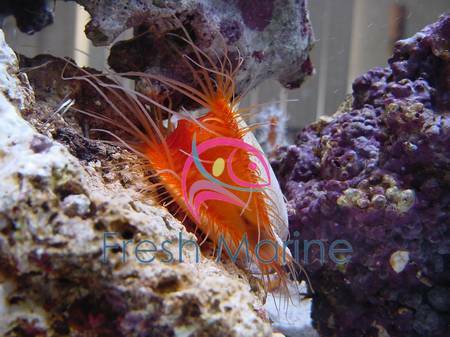 Aggression: Electric Scallop is non-aggressive towards the marine aquarium invertebrates. Compatibility: The Lima species is reef compatible. Venom status: Electric Scallop is non-poisonous in nature. In its natural habitat, the Lima species gathers small rocks and small coral pieces at one place and achors itself into them. When disturbed, Electric Scallop claps its valves simultaneously while using its tentacles to cruise through water. The Lima species is Nocturnal in nature and is therefore active at night while remaining hidden away during the day time. Tank type: To host Electric Scallop, you should have a well established Reef Type Marine Aquarium. Aquarium set-up:Keep rocks, rock caves, ledges, coral rubble and sand in your reef tank for the Lima species to hook itself in. You may place more than one Electric Scallop in your marine aquarium if all the other tank members are peaceful towards it. Water flow in the aquarium: The Lima species requires moderate water current in the reef tank it inhabits. Temperature of water: Seventy-two to seventy-eight degrees Fahrenheit or twenty-three to twenty-six degrees Centigrade. Illumination: Electric Scallop requires high intensity lighting in the marine aquarium hosting it. Diet: The Lima species is Planktivorous in feeding habit. Food content: Electric Scallop derives its nutrition mainly through photosynthesis, which is performed by Zooxanthellae, a photosynthetic alga living within the scallop. Electric Scallop also filter feeds on Phytoplankton. Supplements: You may target feed the Lima species with the small amount of phytoplankton, Marine Snow and Selcon. Benefits: Owing to its stunning looks, Electric Scallop can considerably enhance the visual appeal of your marine aquarium. Electric Scallop is difficult to maintain. Blennies, Shrimp, Angelfish, Butterfly Fish and Clown Gobies may attack the Lima species and hurt it. Therefore, do not keep these aggressive m,arine invertebrates with Electric Scallop. Be careful to maintain the desired Calcium level in the water. The pH of your aquarium�s water should also be maintained. Nitrates and Copper in any form in your marine aquarium may prove lethal for the Lima species therein. Aquarist�s level: Due to a high level of maintenance requirement, it is better that experienced aquarists handle and maintain Electric Scallop.